A place for Em and M to discuss books, post reviews, and support our favorite authors! In a bet between two old flames . . .
Rex Leighton dominates the boardroom by day and prowls the ballroom at night. Searching for the perfect bride to usher him into the aristocracy, he abandoned the idea of love the last time he saw the delicious May Sedgwick. But when he’s roped into a bet, where the prize is the means to fund his greatest ambition and the stakes are a marriage he’s already planning for, Rex is willing to go all in. There’s just one problem—he’s competing against the only woman he’s ever loved. May Sedgwick could be the belle of the season . . . if she cared. She is more interested in the art studio than the marriage market and her craving to pursue her passion far outweighs her wish for a titled husband. Winning this bet will finally allow May to follow her true artistic desires. Rex losing is just a side benefit, as are his breathtaking kisses that she just can’t resist. When May is forced to choose between the dream she never knew she wanted and the man she’s never been able to forget, Rex must convince her desire is worth a bit of danger. And . . . she was a fool. The dancing energy in her chest diminished, and the little seedling of hope shriveled up and slid down, just like her shoulders. When her corset began to press in under her arms, she straightened up to correct her unladylike slump. “Against your will, then? This rogue desire to see me finally beat out your better judgment?” Sarcasm had never been her strong suit. She hadn’t mastered the right tone. May gulped the sip of tea she’d intended to take. She spluttered as the liquid seared a trail to her belly, firing her body until it was as hot as her cheeks. He shifted on the settee across from her so that his leg pressed against her skirts. She wanted a bit of cool water, a snowflake, perhaps an iceberg to ease the heat coursing through her. Drinking more tea wouldn’t help, but she did it anyway, in a desperate attempt to deflect the intensity of his gaze and the effect of his admission. Christy Carlyle writes sensual, and sometimes downright steamy, historical romance, usually set in the Victorian era or Regency period. She loves heroes who struggle against all odds and heroines that are ahead of their time. A former teacher with a degree in history, she finds there is nothing better than being able to combine her love of the past with her die-hard belief in happy endings. Find it all on Amazon! Hello everyone! Glad you found us! Please take a look around, click some links, and meet some new authors and books! If you have any ideas, suggestions, or questions, feel free to email us at EmandMBooks@gmail.com. 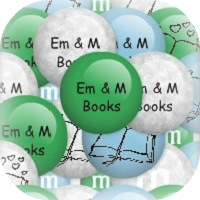 Em & M Books is a participant in the Amazon Services LLC Associates Program, an affiliate advertising program designed to provide a means for sites to earn advertising fees by advertising and linking to amazon.com. 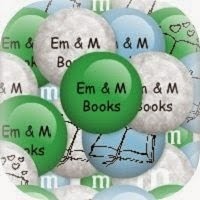 A place for Em & M to discuss books, post reviews and support our favorite authors! Copyright Em & M Books 2014 .. Awesome Inc. theme. Powered by Blogger.